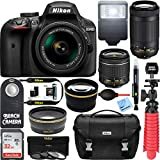 The Nikon D3400 is an entry-level DSLR designed as an upgrade of the D3300 and targeted toward anyone who wants to upgrade from the average smartphone camera to an advanced shooting platform. It is built around the same 24-megapixel sensor found in the D3300, with an Expeed 4 image processor. Think you are ready to advance to a high-performance camera? Keep reading this Nikon D3400 review to learn more about the camera and if it is right for you. we will go trough its specs, battery life, picture and video quality, and a deeper comparison between the Nikon D3300 vs D3400 DSLR cameras. The Nikon D3400 is the latest addition to the company’s D3xxx series which prioritizes lightweight, compact, and simple design while providing the advantages of the interchangeable lens. It is lighter than the D3300 (reviewed here) and offers an extended battery life of 1260 shots – but we will go into a more in-depth comparison outlining the difference between the D3300 vs D3400 later in this Nikon D3400 review. The camera boasts an APS-C sized sensor with a very respectable 24.2MP pixel count, which is to be expected at this price point. The lack of an optical low-pass filter goes a long way towards helping capture better detail. The sensitivity range is reasonably wide and works with the Expeed 4 image processor among other features to ensure high-quality recording and 5 fps burst shooting. We will go into the picture and video quality of the D3400 later in this Nikon D3400 DSLR camera review. Without a low-pass filter in front of the sensor, the Nikon D3400 picture quality is quite detailed. Still images are somewhat soft towards the edges of the frame at wider apertures. You get really good sharpness in the center of the frame when you use the camera in intermediate focal length. Some curvilinear distortion and chromatic aberration is noticeable in RAW files, but both are dealt with automatically and successfully in JPEGs. The Picture Control feature provides a wide array of color options to work with so that you can create customized work while minimizing post-processing. You can alter the camera’s metering system between multi, spot and center-weighted options. You will be pleased to know that it doesn’t overexpose when working in low light conditions, but there is a tendency to underexpose when in brighter conditions. The Auto White Balance feature doesn’t disappoint and does exceptionally well under artificial lighting, which is one of the most impressive features we’ve come across during this Nikon D3400 review. While the Nikon D3400 doesn’t stretch to 4K recording, the Full HD recording produces good results. A little rolling shutter is visible when shooting scenes and the Nikon D3400 kit lens focuses smoothly during recording. Considering that the Nikon D3400 is an entry-level camera, it doesn’t come as a surprise that the body is mostly made of a composite plastic material. The control design is very simple, making it easy for learners to choose and manage settings on the fly. The Exposure button sits next to the shutter release button and so does a button labeled “info,” which you can use to display all of the major settings on the high-resolution screen. A small LV button at the back makes switching to Live View Mode a simple affair. Like with most entry-level DSLRs by Nikon, the D3400 doesn’t have a body integral motor. However, there is an “electronic rangefinder” function that tells you how far you’re from the perfect focus. The textured coating around the grip gives the feel of quality build. The included VR kit lens is retractable, meaning that it folds up to a smaller size when not in use. However, the Nikon D3400 DSLR camera doesn’t come with a built-in wi-fi function. The disadvantages we came across during this Nikon D3400 review are highlighted below. SnapBrige features and performance are limited due to lack of inbuilt Wi-Fi. The Nikon D3400 is an excellent performer built around a 24.2 MP sensor and specially designed for beginners. It is quite simple to use what with its easy-to-navigate menu and clearly labeled control buttons. The camera is a strong performer and comes with an 11-point AF focus system. Its ability to deliver stunning image quality at a low price point is one of the things that makes it popular among first-time ILC shooters. While we wouldn’t recommend it to videographers, the Nikon D3400 DSLR camera makes a good purchase for casual photography and anyone who wants to upgrade from their smartphone camera. In this section of our Nikon D3400 review, we will focus on a comparison between the D3300 vs D3400, what they have in common, and the main difference between Nikon D3300 and Nikon D3400. The Nikon D3400 DSLR camera has a significantly greater maximum ISO (25,600 vs. 12,800 in the D3300) and an extended battery life. It’s also a bit more lightweight than the previous Nikon DSLR model from the D series and has a slightly higher color depth and dynamic range. The Nikon D3400 also comes with bluetooth and smartphone remote control which cannot be found in the D3300, and also has a slightly lower price. However, this means Nikon had to give up some other features that are present in the D3300. These include the microphone port and the ISO performance which is better in the D3300. After going through its specs for this Nikon D3400 review, we consider it an overall improvement to its predecessor in terms of image quality, performance, battery life, and ease of use. However, the lack of the microphone port could be a deal-breaker for those who want to record videos with high-quality audio. This Nikon D3400 review has established that the camera is designed around a 24.2-megapixel APS-C sized sensor. It’s also established that it is a high-performance camera, at least compared to other models in the same price range. The relatively fast single-shot autofocus, quick startup, good image quality and extended battery life are some of the qualities that make it a good purchase. With no external mic port and removal of the in-body sensor cleaning, one would expect there to be a few more updates to the Nikon D3400. That aside, this camera offers more than enough room to improve your photography skills. And in any case, the D3400 is worth every penny you spend.